The manager, who has asked not to be named at this time, said she was moved to comment, not in the form of a blog but in a more objective way, having read in the local media about the recently concluded job fair hosted in the First District by Honourable Andrew A. Fahie (R1). “There is no unemployment in the BVI. Unemployment is for who don’t want to be employed. I didn’t want to blog it but it’s the fact. I am a BVIslander [and] I am in the hospitality industry. I know what is going on. BVIslanders need to change their mentality. That’s what the whole thing is about,” said the woman. According to the hospitality manager, one of the issues is that persons are not willing to relocate to sister islands to take up employment and business owners are left with no alternative but to bring in labour from outside of the territory. “There are jobs you know, but the thing is that people are not willing to re-locate. So then you have people from other Caribbean islands willing to relocate and they come in and they are finding employment,” said the concerned manager. 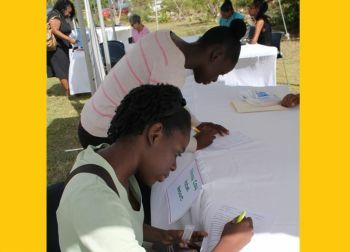 It is the manager’s opinion also that persons need to re-qualify themselves to suit the job market in the VI. “The young people need to get re-qualified for what is in the market, what the market is calling for. In this industry (hospitality) we have jobs for chefs, cooks, we can’t find nobody to fill those jobs, boat captains that’s rampant. The young people need to make themselves marketable based on what’s available here. They need to work with what the market is offering,” she added. Hon Fahie argued that when the aforementioned is done then and only then can one be able to accurately conclude if what is being said is factual or not. The problem with locals is they want high profile office jobs with no credentials or experience to back it up. Expatriats will end up taking all the jobs leaving the locals unemployed. I am a hotel manager too and I notice these things happening as it pertains to the locals and they need to get rid of this born here mentality. Unemployment is really indeed for those who wants to be unemployed. Those in authority keep burying their heads in the sand and believe if they don't see what is going on, that nobody else will. if you dont teach the children from young to love their home and give back in ways that help their homes, all of them will be white washed into being collar criminals and boogie tight necks behind desks actin like they know something but just giving orders. Tortola is a place where people like status. yall only got urselves to blame because no schools around here from the elementary level focus on such things. The BHD use to work in the past. Its not working now. Employers need on the job results. And discipline. Every country you go to locals are the same. That's why foreigners do so well in other people country. They go with a mind set to work and make their life better. Keep singing that globalization tune you evil biotch. New World Order. Jobs go to the lowest bidder, wherever they come from, and the only ones getting richer are the rich. Filipinos are taking over the world, not just the BVI. Do you think this conversation isn't happening everywhere? This is what the world leaders want, and I don't mean the ones we elect, I mean the ones that they obey. As long as they can employ the cheapest and easiest employees on the planet, their wealth increases. But what about the rest of us? Do we have the right to an honest living in our own country? The Prime Minister of Canada just lost his 12 year leadership over this same issue. He had a secret 'temporary foreign worker" program to fill every entry level job with Filipinos while his own countrymen went jobless. And when the public found out, he was finished. Voted out. BVIslanders, do the same. @john doe Dont care for your opinion cause you are a big Manager and are you looking persons who are seeking employment? Didnt hear you say that. Ayo go to miss P for a job because she said and i quote "the economy is good, jobs for all"